For things to keep getting interesting, keep changing your regular approach. Say yes to life be' weird and spontaneous say yes to opportunities and say no to those who think you're crazy. If you can bring your consciousness, your awareness, your intelligence to the act, if you can be spontaneous, then there is no need for any other religion, life itself will be the religion. My way of thinking is that if you plan everything your life will be boring and who wants a boring life. Live spontaneously. 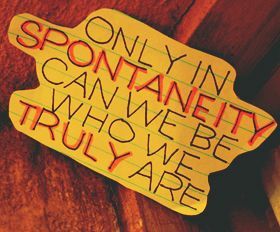 Live spontaneously!! Don't want a boring life. One of the most beneficial and valuable gifts we can give to ourselves in this life: is allowing ourselves to be surprised! Love has no time constraints. There is no time frame for when a person can fall in love with another, it just happens. It's spontaneous, unpredictable, it's timeless. Sometimes love happens by accident, when you least expect it. You can't prepare for it, you can't be ready. It just happens. Remember, every worthwhile venture in life intimate love, friendship, a new business, etc. is scary. These things are inherently risky. They are unsafe. These things aren't for the faint of heart. They take courage. And most importantly, they can coexist with fear. Spontaneity is impulsiveness and is the action done in response to any action that bothers us. “The essence of pleasure is spontaneity” says Germaine Greer. There are certain things which need to be done spontaneously. “If we wait to do everything until we are sure its right you will probably never do much of anything “said Win Borden. This is a highly competitive world and a fast world at that. If you miss an opportunity, there are scores in line to do that. Hence spontaneity is the order of the day. We cannot afford to wait for the answer for every question. The day demands that we have to take chances and one who is brave enough to jump into the rough waters with spontaneity, gets more opportunities than others. This gives him more pleasure and victory. Read these quotes on spontaneity and it will help to make a change in attitude.